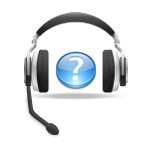 If necessary, a specific technical support is also available, in addition to Sistre's free F.A.Q. Sistre's free F.A.Q.s normally answer to most of the current questions you may encounter. It is therefore a good habit to read it before asking any question to Sistre's Technical Support. No fix maintenance charge is therefore necessary, as your support units will only be debitted on your account when you use it, without any date constraint. Per contra, you must ensure on your Account Data that your support account has a sufficient credit before asking any non-standard question to our technical support.